Once just a small town in Phoenix’s Southeast Valley, Gilbert has become a destination for many moving to Phoenix and is one of the top-rated neighborhoods in Phoenix. Along with Chandler, Gilbert’s been one of the fastest-growing towns in the country since the 80s and has almost doubled its geographic size to accommodate so many residents. Despite continual growth, Gilbert has consistently received excellent ratings for being a family-friendly community. With one of the highest concentrations of family households in the state, being considered one of the safest cities in the U.S. and placed 22nd on Time’s best places to live in 2014, Gilbert is a solid option for families. Gilbert’s residents are amongst the most educated in the valley while the Gilbert Unified School District is the highest ranked in Arizona’s school-rating system. Since it’s such a great area for families, you can expect many options for family-friendly activities (though not as much nightlife as you might find in Tempe or Scottsdale). There are over 700 acres of open land devoted to recreation and entertainment with basically a park within every major residential block as well as many shopping destinations such as the Superstition Springs Center, SanTan Village or Downtown Gilbert. In fact, Downtown Gilbert is turning into another destination not only for local residents, but for those from all over Phoenix proper with its addition of restaurants and retailers such as Lolo’s Chicken and Waffles and Postino Wine Café. You’ll find a bunch of community events happening throughout the year such as the Downtown Concert Series where you can catch a free concert several times over summer at the Water Tower Plaza in Gilbert’s Heritage District. Also, check out BARKtoberfest if you are looking for a pet friendly event to bring your pup to hang out with other pet owners or feel like entering your companion in a look-a-like or best dressed contest. With the population growth, Gilbert’s healthcare has grown as well. Many move to Gilbert to work at Mercy Gilbert Medical Center and Banner MD Anderson Cancer Center, Gilbert’s two largest employers that have developed considerably over the last fifteen years. Meanwhile, there’s a high-tech presence within Gilbert with companies such as Go Daddy Software and Intel (right next door in Chandler) as well as Orbital Sciences Corporation. 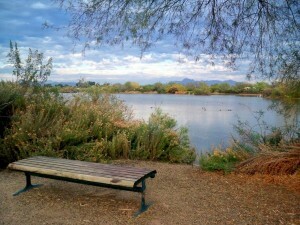 As far as living options goes, there’s a lot to choose from in Gilbert. There are several master-planned communities such as Power Ranch or Adora Trails that come with neighborhood amenities, parks and the occasional house for rent. However, those apartment searching in Gilbert will find most of their options within easy access to the highways. The apartments for rent in Gilbert range from cheap apartments such as studio apartments with all bills paid to the finer, luxury apartments and condos. Agritopia may be Gilbert’s most unique neighborhood due to its focus on integrating working agriculture into its neighborhood. The community is comprised of 166 acres with dozens of acres devoted to orchards, active pastures and farmland, yet is surprisingly close to the 202. Although there are not any apartments right within the neighborhood, apartment guides will show that there are some options such as houses for rent and luxury apartments nearby. Even though commuters to Downtown Phoenix may not be the biggest fans, living on the outskirts of Phoenix grants residents great proximity to Arizona’s beautiful wild lands. For example, Lost Dutchmen State Park is only 30 miles within the Superstition Mountains. According to legend, there is a lost mine within the mountains with factual origins, though it’s never been found. Even if you don’t find the mine, it’s still a great place to camp. And if you are trying to stay in town, but want to stretch the legs out on some walking trails and do a little bit of bird watching, the Riparian Reserve at Water Ranch is right in town and boasts a total of 110 acres with 70 acres making up the seven large ponds. If you are new to Phoenix, there’s a chance that you have underestimated the weather. You know it’s hot, but you won’t appreciate how hot the average high of 105 can be. Your best bet is finding apartments with a pool (not hard to do) or with utilities included, so you can blast the A/C all summer long. RentLingo is your trusted apartment finder in Gilbert. We hire local experts, such as former property managers and locators to anonymously tour and consistently rate and review every available place. They share their honest and unbiased perspective with you, so you know how every rental ranks in the area. Because our experts tour every property, we can offer consistent apartment ratings across every region. So unlike finding a Backpage or Craigslist rental, you can trust these apartments are verified and trustworthy: whether it's a cheap studio or a one bedroom with all utilities paid all the way up to a nice house for rent or a luxury condo.